Allah's most important attribute is Al-Rahmane Al-Rahim and because of this most important attribute, He started the Creation of seven layers in our universes in order to give us second respite so we could redeem ourselves. That is why when the first sura (96) revealed to prophet Muhammad started with Bismillah Al-Rahmane Al-Rahim meaning from Allah The All Gracious, The All Merciful. Just like, when you write an official letter, on the top of the letter you write your name and your last name, that means this letter is sent by so and so person. If you search for old official letters you would know what I mean. That is why sura 9 does not have any Bismillah, because it is coming from Allah and His messenger Muhammad. Otherwise, instead of just it should have said, "Bismillah Rahmane Rahim va Bi-ism Muhammad." Now that you know, please stop saying "Missing Bismillah!" Allah created the Arabic Quran with His own knowledge, and He Did Not Miss anything! Therefore, only in sura Al-Fatihah, Bismillah means "In the name of Allah, or I start with the name of Allah, or O Allah. It is just like when you received a letter and some one is reading it to you, then you ask, "Who is it by?" And they tell you it is, In the name of so and so, It is from so and so. . .
Also you may view it in another direction, for example you may ask, who's is this house belong to? And they would tell you "It is in the name of so and so person". That is why right at the beginning of the Arabic Quran when it says that means this book belongs to Allah, which Allah? The One Who has chosen The Most Gracious, The most Merciful as an attribute for Himself. Sura Al-Fatihah is sacred words of Allah, and we repeat it 17 times a day in our Contact Prayers, in order to redeem ourselves. This sura has been the most repeated sura by humans from the beginning of Creation, and it would be the most repeated sura to the end of the world. And that is the only sura which we address Allah, and we speak to Allah. That is why there is no "Bismillah," "from Allah" on the top. And the rest of the suras in the Arabic Quran, Allah is addressing us. Now Muhammad is receiving the first revelation of the Arabic Quran sura (96). It says on the top, from Allah The Most Gracious, The Most Merciful. Then the first ayat say, (Iqra bi-ismi rabbika allathee khalaqa) "Read In the name of your Lord, who Created." Therefore, Muhammad starts reading the Arabic Quran by saying, (Bi-ismi rabbi allathee khalaqa) "In the name of my Lord, Who Created." Why? Because, the most important attribute after is Creation. If there is no Creation there would not be no guidance, and no righteousness would exists, no bad and evil, would not be any universes, and there would be no Arabic Quran, and so on. Right from the beginning Allah is telling Muhammad how to read the Arabic Quran. Therefore, Allah is teaching us that when we start to read the Arabic Quran, either from the beginning of a sura or from the middle of a sura, or when we start to read sura (9) we should start by saying, (Bi-ismi rabbi allathee khalaqa) "In the name of my Lord, Who Created." That was how Muhammad learned how to start reading the Arabic Quran. Then when the 70th sura was revealed to Muhammad, sura number (16) "Honey Bee", there Allah tells him, "Seek refuge in Allah from stoned satan, when you read the Arabic Quran. Remember Muhammad was reading the Arabic Quran, not an English Quran or Farsi Quran (16:98). It means Only when you read the Arabic Quran, that was the Quran which Muhammad was reading from, because Translated Qurans has already been Stoned by Translators. Then (16:99) says, "Although satan Does Not have any authority over the believers, and those who take Allah as their Attorney." Therefore, for the true believers it does not matter, satan can not deceive them! That is why this phrase did not come on sura 96. Yet, a true believer dose repeat (16:98). "Where Are Those People Who Were Guided By Your Translations?" In sura 27 when Soleymon sent that famous honorable letter to Saba, after he put his name on the top, "Bi-ism Soleymon" then he wrote down, that means although I am sending you this letter, but Allah is addressing you, this is from Allah Who is telling you. Then the next ayat says, "Do not be arrogant; come to Me as a submitter" (27:31). Otherwise, if Soleymon would have uttered such a phrase, he would have considered an Arrogant person, because you can not force people to become a submitter. We have known about the relations between number 19 and 44 which is awesome. If you look at (44:19) you would see the same phrase was repeated, but here Moses says, "Do not be Arrogant against Allah." Otherwise he would dare to use a phrase like that. Allah's Creation in our dimension is based on number Seven. That means number 7 is the most important number in our universe as far as the Arabic Quran is concerned. Allah Created 7 skies in layers, 7 skies and the same number of Land, 7 pairs of initials in the Arabic Quran, 7 doors of Hell, 7 Seas as inks, or every 7 years we have drought, and sura Al-Fatihah for our redemption has 7 ayats. And the total number of days in a week are 7. Zakariyaa's wife name was Elizabeth. And Elizabeth is a Greek translation from Hebrew name "Eileshabaa". "Eil" means Lord, Allah, and "Shabaa" or "Sabaa" in Arabic language means 7. So Elizabeth means, Allah 7. And number of Initials in sura 19 is 798 which is 114 x 7. Allah created for us music with only 7 music alphabeths, notes, and He drop on us somany varieties of melodies from "The place which is Hidden," "Al-Ghaayb" through "Al-Morsellat" sura 77 for our enjoyments. With these 7 notes Allah makes musical instruments talk, and with these same notes we can communicate with musical instruments as well, just like we communicate with each other through our 26 English alphabeth letters. Allah be Glorified. As you see in these 3 different calendars the working days start on Sunday and continuse up to Thursday the 5th day. So that will make the 5 days working in a week. And then Friday is a working day as far as the Arabic Quran concerns. As we read in the Arabic Quran (62:9), "On Fridays we should drop all businesses and go for Friday Prayer." Therefore, Friday would be the last working day of the week, then Friday makes it the 6th working day of the week or the last working day of the week, or basically the last day of the week. Thank Allah is Friday! . We found out that number 7 is the most important number in our universes, and the whole creation of Allah in here is based on number 7. Then as far as our dimension concerns, it takes some times in order to create something. Then Allah says, the creation of the skies and the land took 6 days. Or in (50:38) we read, We created skies and the land in 6 days, and no fatigue touched Us. Or in (40:9) we read, Allah Created the Land in 2 days. And in (41:10) we read, Allah calculated the propvisions in 4 days. And in (41:12) we read, He completed the seven universes in 2 days and set up the laws. As you notice Allah talks about the days which took some times to create our universes, and it took some times in order to create our provisions, and creation of this earth. All of these are working days, and not resting days. And as we notice there is no 7th day in the Arabic Quran. Yet all the days are only 6 working days, and the result of that was creation of these whole universes. Allah is telling us that working days are on base number 6 and there is no 7th day in the Arabic Quran. Now if you look at the calendars above you would see the same thing. They are all show 5 days working plus Friday, which is the last working day of the week. Obviously if you do not work it does not count. And we know that we should not work on the day of Sabt. So when we do not work on the day of Sabt, therefore it dose not count at all, because we did not do anything, we did -0-, zilch, nothing! Allah gave us all the examples in the Arabic Quran, so if you come up with an example which you do not see them in the Arabic Quran that means they are manmade (17:89). These calendars already existed with the truth, but we just did not pay any attention to them. Thank Allah for His Hikmah and knowledge. Allah The Almighty already gave us mathematical confirmations regarding Contact Prayers 22 years ago, and we do not want to destroy them. Friday prayer is only 2 Rakkat NOT 4 Rakkat. And Friday is the last day of the week. 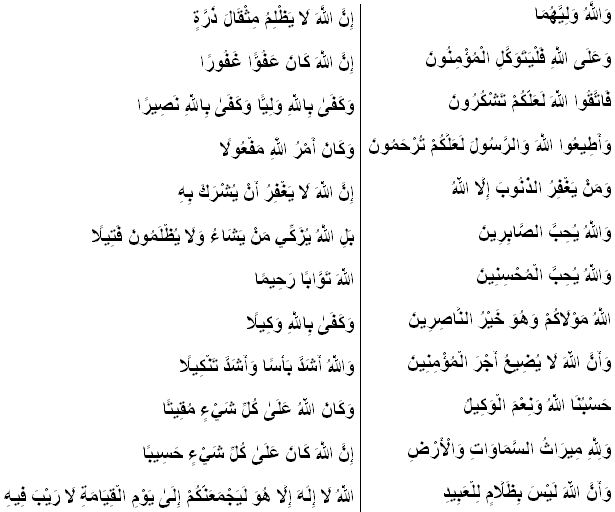 When we commemorate Allah in our Friday Contact Prayer, the words we use must be repeated in Arabic language only. Remember the Arabic Quran contains Healing, and Blessing (17:82), there is Guidance in the Arabic Quran (2:185 and 17:9). The Arabic Quran is Great (15:87). The Arabic Quran is Honorable (56:77). The Arabic Quran is Glorious (50:1). The Arabic Quran is full of Hikmah (36:2). The Arabic Quran has Allah's light in it (5:15). The Qurans which stoned with different languages are cursed already and DO NOT have the same qualities as the Arabic Quran has. Allah wants us to speak in Arabic language when we make our 5 daily Contact Prayers with Him. When the Contact Prayer's line openes up the only language spoken would be in Arabic language. 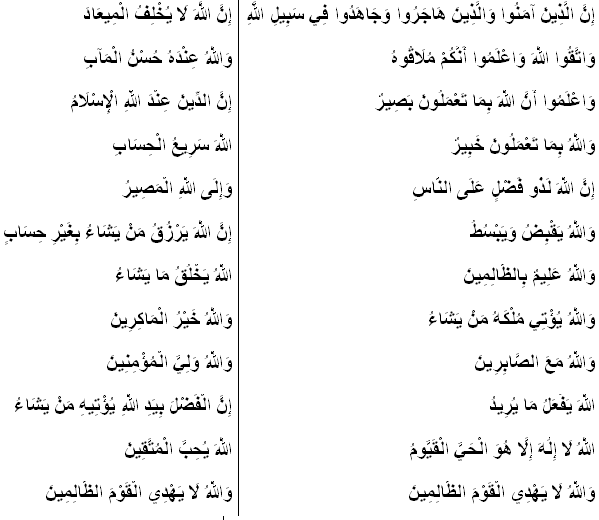 We can not perform some of the Contact Prayers in Arabic language, and then some other ones in different languages!. . . You never know may be after a few more months we would come up with an idea that we should perform our Night Contact Prayers with 2 Rakats in English or Farsi language and then the rest in Arabic language! Please people follow Allah's Arabic Quran by following the Arabic Quran you would not go wrong. Let us all purify the religion of "Submission" for Allah. This number (17) is the total number of units in the five daily Contact Prayers. As Allah says in the Quran, all of those who where submitted to Allah, such as Adam, Noah, Abraham, Lot, Joseph, Jesus, Moses, Muhammed, and Rashad used to perform Five daily Contact Prayers. Daily Contact Prayers consists of 2 units at dawn, 4 units when sun declines from its highest point, 4 units for the middle Prayer, 3 units after sunset, and 4 units at night. Thank GOD for colors ! Mathematical Confirmations on Five Daily Contact Prayers and "Friday Prayer"
Pleae make sure the leader of the Friday Prayer (A Man), and all the other ones would face the Qiblah while standing up just like other Prayers. The leader of the Prayer (A man) Comemorates Allah with those words from the Arabic Quran, and the rest of the people repeat the same words. So he (Man) would read each phrase, and he will wait for others to repeat the same phrase and then go to second phrase. If a woman is alone by herself, then she would do the same as the leader of the Prayer does. Do you remember when you were commemorating Allah on the 27th night of Ramadan? Above are the same words you were commemorating on, then use the same words in Arabic language, when you perform your Friday Prayer. Allah wants you just to commemorate Him on your Friday Prayer. 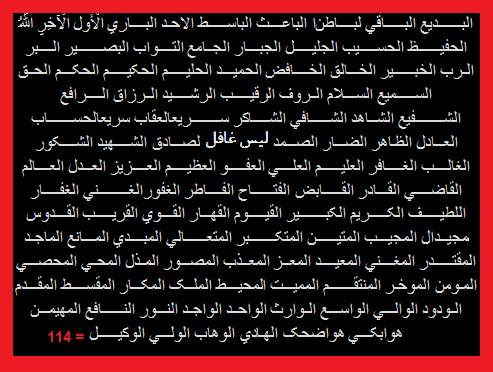 These words must be repeated in Arabic language only. Remember the Arabic Quran contains Healing, and Blessing (17:82), there is Guidance in the Arabic Quran (2:185 and 17:9). The Arabic Quran is Great (15:87). The Arabic Quran is Honorable (56:77). The Arabic Quran is Glorious (50:1). The Arabic Quran is full of Hikmah (36:2). The Arabic Quran has Allah's light in it (5:15). The Qurans stoned with different languages are cursed already and DO NOT have the same qualities as Arabic Quran has. Allah wants us to speak in Arabic language when we make our 5 daily Contact Prayers with Him. When the Contact Prayer's line openes up the only language spoken would be in Arabic language. We can not perform some of the Contact Prayers in Arabic language and then some other ones in different languages!. . . You never know may be after a few more months we would come up with an idea that we should perform our Night Contact Prayers with 2 Rakats in English or Farsi language and then the rest in Arabic language! Please people follow Allah's Arabic Quran by following the Arabic Quran you would not go wrong. Let us all purify the religion of "Submission" for Allah. Do Not Slave Yourselves To Quranic Translations, They Are Not From Allah, Instead Learn Allah's Arabic Quran.